Word Press tells me when someone links to my blog. I saw a new incoming link that I’ve never seen before this afternoon, so I decided to check it out. 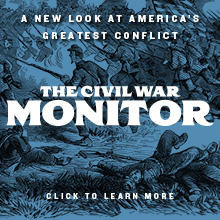 The link came from another new Civil War blog that has just launched. It’s called Civil War Navy, et al., run by Andrew Duppstadt. Andrew is the Assistant Curator of Education for the North Carolina Division of State Historic Sites and is a Civil War naval reenactor. Welcome to the blogosphere, Andrew. I’ve added a link to your blog. Wow, I Haven’t Done That in a Long Time…. People often ask me how I manage to practice law full time and be a prolific writer. I always tell them it’s all about discipline, but there’s really more to it than that, although self-discipline is certainly a critical element of my success. I’m extremely fortunate to have an extremely understanding and cooperative wife in Susan. She wholeheartedly supports my work, and her indulgence goes a long way toward making me as productive as I am. I’ve also been fortunate enough not to have been blessed with being handy. I’m not. I have a few very basic skills, but beyond that, I’m not handy at all. As just one example, the last time that I tired to build something out of wood by myself, it was the summer between my freshman and sophomore years in college when I built a rack for my stereo components. I still have it all these years later. It’s not pretty, but it is very functional. However, it means that I seldom have projects around the house to occupy my time. There’s one other reason. We live on a good sized lot, about four tenths of an acre. That means we have two pretty large yards, including a fenced back yard. With three big dogs, that’s critical. For the past ten years or so (we’ve lived in this house for 12 years), I’ve paid a guy to mow our lawn. It’s something I’ve been more than happy to permit someone else to do. However, with Susan unemployed and my cash flow not flowing yet after leaving the firm, money’s been very tight around here. Consequently, after discussing it, we decided that it wasn’t smart to spend $150 per month to pay someone to cut the grass right now, so we’re going to do it ourselves this year. Susan did it last week, meaning it was my turn today. It’s literally been ten years since the last time I did it, and I’d forgotten just how miserable of a job it is. For one thing, the little trees that weren’t really much of a hindrance ten years ago aren’t so little any more, and they most assuredly are a hindrance now. For another, parts of our back yard don’t drain well, and it’s a gooey, muddy mess in the far left corner. Finally, with three big dogs, there are, shall we say, lots of land mines out there in that yard to avoid. I stepped in one tonight. It took me an hour and a half and I was a sweaty, dirty mess by the time I was done, and my elbow was bothering me, too. I took a shower, and now I’m vegging on the couch. Nick Kurtz has started a new blog called Civil War Musings. His first few posts–about a recent battlefield trip to Maryland–are quite good. I’ve added a link to Nick’s blog. Welcome to the blogosphere, Nick. Have fun. There has not been a new post on the Civil War Gazette blog since January 31, so I have deleted the link to it. If it ever returns, I will consider restoring the link, but for now, goodbye…..
About once per week, I get a call from J. D. about something he has found on Google’s book search site. He spends a lot of time trolling the complete versions of the public domain books that can be found there. He will call me to tip me off to some really obscure source that is of interest, and a fair number of them pertain to Ulric Dahlgren. Yesterday was an especially good one. Abraham Lincoln had three personal secretaries. Two of them are well-known, John Hay and John G. Nicolay. The third is not well-known at all. His name was William O. Stoddard, and Stoddard wrote a memoir of his time at the White House titled Inside the White House During War Times. There was a nice anecdote in the book that recounted a dance that Ulric Dahlgren attended in Washington, D. C. in February 1864, just after being fitted for a prosthetic leg. Doris Kearns Goodwin recounts this incident in her book Team of Rivals, but I had been unable to locate her source, so my working draft cited to Goodwin’s book. When J. D. tipped me off the Stoddard book, I now not only had the primary source, I also had three good quotes to use that Goodwin had not employed. I now cite to the primary source, which is always my preference when writing. The problem is that this sort of thing keeps happening. Folks are constantly feeding me tidbits when they know I’m working on projects, and I really appreciate their thinking of me. Usually, they’re items worth having, so I’m grateful to get them. The problem, however, is that it raises a very legitimate question: when do you have enough? When do you say enough already? I’ve been writing the Dahlgren bio on and off for fourteen–almost fifteen–months now. There have been long gaps due to things going on in my life, but I’ve been diligently pressing forward with this work and it’s pretty much finished at this point. However every time that I think it’s done, something else surfaces like the Stoddard material that J. D. tipped me off to yesterday. My old friend Clark B. “Bud” Hall has been working on a study of the June 9, 1863 Battle of Brandy Station for something like twenty years now. For about ten of those years, I’ve been steadily feeding him primary source material on the battle as I find it. Bud already has hundreds–perhaps even thousands–of sources on the battle, and it really becomes a question of decreasing returns. When do you say “Enough”? A basic proposition is that you will never get EVERY source pertaining to a particular topic. It’s impossible because of the vast amount of material that remains in private hands or is far too difficult to find because it’s in some incredibly obscure place where nobody would ever think to look. That means that, at some point, the historian has to say, “Okay, I’ve given this my best shot” and pull the trigger. I think I’m now at that point with Dahlgren. There is one thing I’ve been looking for, and if it turns up, I will gladly have it, but other than that, I think I can safely say that I have more primary source material on Ulric Dahlgren than anyone else has ever accumulated. Consequently, I’ve adopted the attitude that if someone else can surpass my research, then bully for them, and I will be the first one to shake his or her hand and say “job well done”. There is clearly a point where enough is truly enough, and with the exception of locating this one particiular newspaper account apparently written by Ulric Dahlgren just a few weeks before his death that has turned out to be pretty much impossible to find, I’ve reached my “enough is enough” point with this project. I’ve been searching for that article for several years now, and I’ve pretty much given up at this point after reviewing dozens of papers. It’s literally like searching for a needle in a haystack, and I’ve reached my point of frustration with it. That means it’s about time to pull the trigger and declare the project complete. As promised, here are some of the the pictures from my whirlwind tour of New Orleans and Austin. This first batch is from Metairie Cemetery in New Orleans. 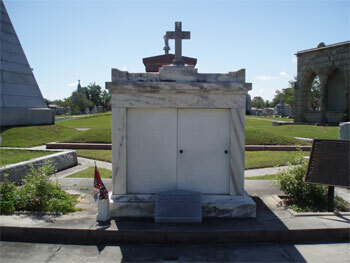 The flag marks the grave of Gen. P. G. T. Beauregard, which is in a mausoleum that houses veterans of the Army of Tennessee. Atop this mausoleum is a handsome equestrian monument to Albert Sidney Johnston. Sadly, I screwed up my attempt to take a photo of it. This is the mausoleum of Gen. John Bell Hood and his family, all of whom died of disease in an epidemic. 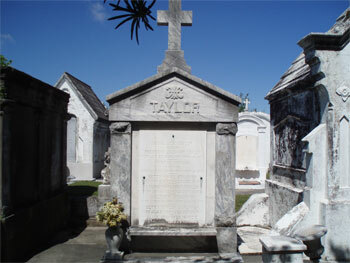 This is the grave of Lt. Gen. Richard Taylor, the son of President Zachary Taylor, and his family. 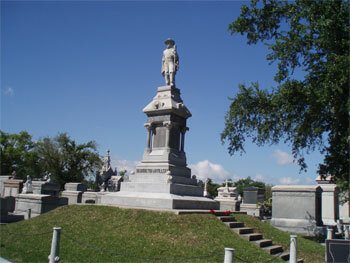 This is a cenotaph to the Washington Artillery of New Orleans, one of the finest artillery units of the American Civil War. Note the upright concrete cannon barrels being used to hold the chains surrounding the monument. 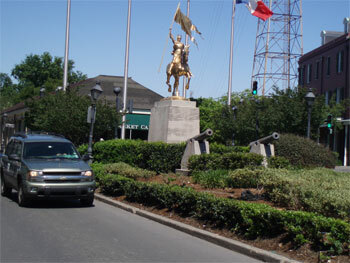 This is a gilt monument to Joan of Arc that sits in the heart of the French Quarter. It was a gift to the people of New Orleans from French President Charles de Gaulle. The next batch of photos is from the Texas State Cemetery in Austin. This is the grave of Confederate Maj. Gen. John A. Wharton, who was killed by a Confederate cavalry officer in Houston on April 6, 1865. This is the grave of Brig. Gen. Adam Rankin “Stovepipe” Johnson, the fine Confederate partisan and cavalry commander. Johnson and his brigade made the trip to Ohio with John Hunt Morgan in the summer of 1863. This is the grave of Confederate Brig. Gen. Benjamin McCulloch, killed in action at the March 1862 Battle of Pea Ridge. 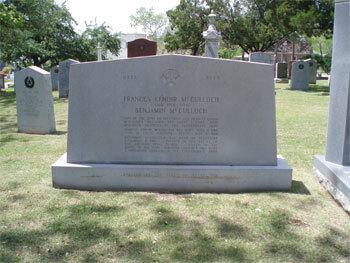 McCulloch was a veteran of the Texas War of Independence, the Mexican War, and Texas politics. 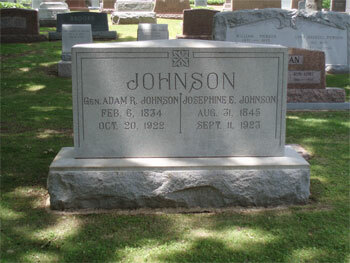 Gen. Albert Sidney Johnston is also buried in this cemetery. He was briefly interred in New Orleans and later moved to Austin after he died in action at the April 1862 Battle of Shiloh. Unfortunately, I wasn’t able to figure out how to get a decent photo of his grave, which is topped by a sculpture of the deceased Johnston lying in repose in his Confederate general’s uniform. 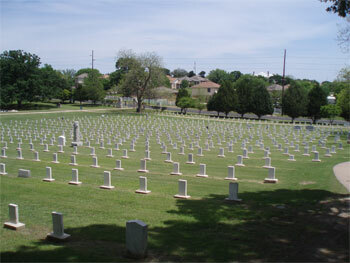 There was a Confederate old soldier’s home in Austin after the war, and many of those old Rebels are buried in a specific section of the Texas State Cemetery. 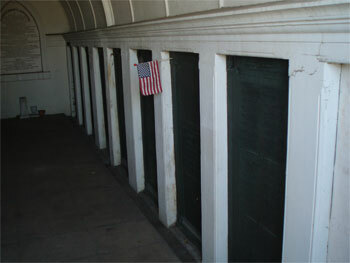 Here’s a panoramic view of some of their graves. This is the grave of Stephen P. Austin, the father of the Texas Republic. 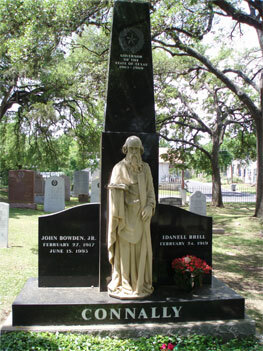 This is the grave of former Texas governor and Secretary of the Treasury John Connally and his wife. When Connally died, apparently, the FBI wanted to see about recovering bullet fragments from the Kennedy assassination from his body. This is a monument to the victims of 9/11. The girders are from the Twin Towers. The Texas state flag you can see in the distance is flying at half staff in honor of the victims of the mass killing at Virginia Tech. 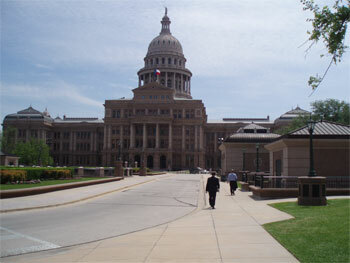 This is the State Capitol of Texas. The dome of this building is higher in elevation than the dome atop the U. S. Capitol. 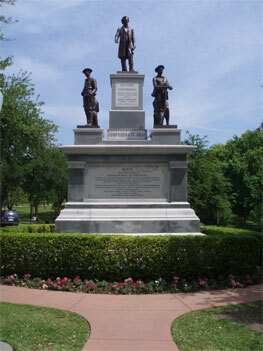 This monument pays tribute to Texas’ contributions to the Confederate cause. 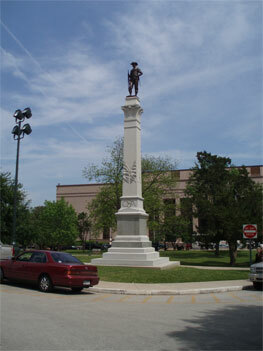 Jefferson Davis stands atop it, along with an infantryman, a cavalryman, an artillerist, and a sailor. There are some statistics included, and a list of every engagement where Texas soldiers participated. 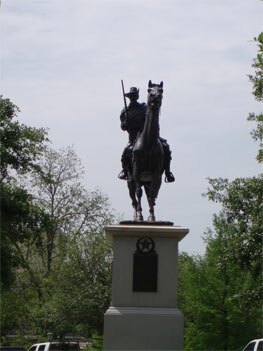 This is a monument to Terry’s Texas Rangers, also known as the 8th Texas Cavalry. This is a monument to the Texas Brigade of the Army of Northern Virginia, one of the hardest-fighting units of all of the Confederacy. This is a monument to the defenders of the Alamo. 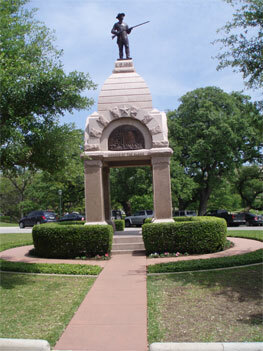 It’s a handsome monument with a beautiful bas relief of the Battle of the Alamo on its face. This is my host, Dan Laney, the president of the Austin CWRT. 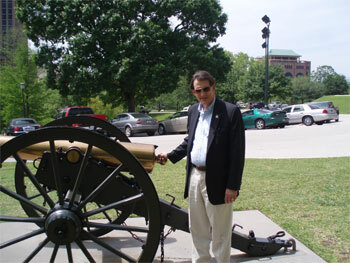 Dan is standing alongside one of two brass Napoleon guns outside the Texas State Capitol. They date from the spring of 1865, after the surrender of the Confederacy. There are a few more photos, but these are the best of the lot. It was quite a trip. When I got home yesterday, I had a wonderful and completely unexpected surprise waiting for me. Although it was not due out until July 1, the University of Nebraska Press has just released the new edition of my book Glory Enough for All: Sheridan’s Second Raid and the Battle of Trevilian Station, which has been out of print for about four years now. The new edition is identical to the original edition, although it’s been completely re-typeset. I was always very, very unhappy that Brassey’s allowed the book to go out of print, and I’ve been eagerly awaiting its re-release for a year now. As I said, I didn’t expect it until July 1, so the fact that it’s out now was a very pleasant and unexpected surprise when I got home yesterday. The whirlwind trip is over. Here’s a recap. Susan will post my photos over the weekend. I left on Wednesday morning. My flight out was at 6:00 AM, meaning that the alarm clock went off at 4:15, an obscene hour. I can remember times in my youth when I wasn’t finished throwing up at that time of the night, but those days are LONG gone. Now, the thought of getting up at that hour is enough to make me tired just to think about it. I flew to Atlanta and changed planes, arriving in New Orleans a few minutes before 10:00 local time. Charles Nunez, my host, took me straight to Metairie Cemetery. 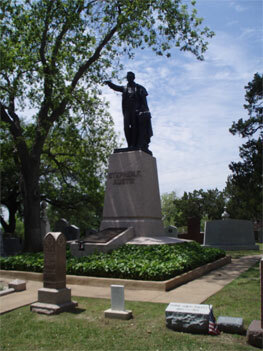 PGT Beauregard, John Bell Hood, and Richard Taylor are all buried there. Jefferson Davis rested there for a couple of years before being moved to Richmond, and so did Sidney Johnston. There’s a handsome equestrian monument to Sidney Johnston in the cemetery. Baseball Hall of Famer Mel Ott is buried in that cemetery, and so is Louis Prima of “Just a Gigolo” fame. I’d seen photos of New Orleans cemeteries, but had never been in one before, and it was just as interesting as I expected it to be. 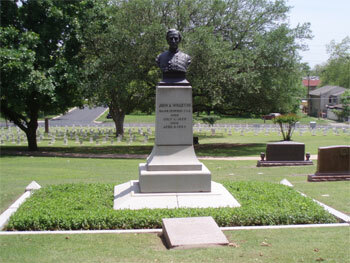 There is a monuemnt to the men of the Army of Northern Virginia in the middle of the cemetery, and one to the Army of Tennessee where the monument to Johnston stands and where Beauregard is buried. We left there, briefly visited a couple of other cemeteries, and then headed downtown, passing through the 17th Ward to get there. I couldn’t see much from the freeway, but Charles tells me that half of the local population has never returned after Katrina. There’s plenty of wreckage and debris from the storm left to be seen, and it’s really kind of shocking to consider just how much destruction occurred. I did get a good look at the infamous convention center and the rehabilitated Super Dome, both of which played major roles in the Katrina tragedy. We then went to lunch, and after lunch, we had a driving tour, passing the D-Day museum and the Confederate Memorial Hall, which are across the street from each other. I had REALLY wanted to visit the War of 1812 battlefield just outside New Orleans, but the battlefield was under 12 feet of water during Katrina. The visitor’s center was pretty much completely destroyed, as were replica earthworks, etc. The place is still in pretty bad shape, and Charles suggested saving it for another visit, as hopefully, things will be more like normal and the visitor’s center will be re-opened. I was disappointed, as seeing the battlefield was one of the things I was really looking forward to doing on this trip. Charles then took me to my hotel, the Omni Royal Orleans Hotel, as I had some work to do for a client. I got the stuff done and then had about three hours to wander and explore the French Quarter, which I did. It’s quite a place. I made a point of walking the eight block length of Bourbon Street, but it was mid-afternoon on a weekday, and it was pretty tame. Having said that, I’ve never seen so many strip joints in one place as I saw there. Charles then showed me more of New Orleans, including Anne Rice’s house and the home where Jefferson Davis died, which is just down the same block from Anne Rice’s home. We went to Tulane, where I did my talk. It was a good crowd and a good evening, but it’s the first time that I’ve ever spoken to an out-of-town roundtable and ws not fed dinner. After walking three or four miles, I was starving. Afterward, a member of the group wanted to show me his personal museum. His father was a colonel in the horse cavalry, and he’s had a life-long fascination with cavalry. He owns a number of artifacts from the Little Big Horn battlefield, a hand-drawn map by George Custer, and some of the coolest cavalry artifacts I’ve ever seen. For a cavalry guy, it was heaven on earth. After a stop at a Wendy’s drive-through, it was back to the hotel. The next morning, Charles picked me up far too early (6:45) and we went to a place in Metairie called The Morning Call for beignets, the sugary donuts that Jimmy Buffett sang about in his song “The Wino and I Know”. Fabulous. And then to the airport for the next two flights…. I flew to Austin by way of Dallas/Fort Worth. Dan Laney of the Austin Civil War Roundtable picked me up and we went to lunch, as it was 12:15. After a lunch of excellent Texas barbequed brisket, we went to the Texas State Cemetery. I visited Albert Sidney Johnston’s grave, the graves of John Wharton, Adam Rankin “Stovepipe” Johnson, Benjamin McCullough, and several other Confederate generals. We wandered the Confederate burial field and visited the other notables, including the graves of Stephen Austin, Barbara Jordan, and John Connally. We left there and Dan showed me the home on the University of Texas campus where George and Libbie Custer stayed in 1867, and then on to the state capitol building, which is an incredibly impressive structure. 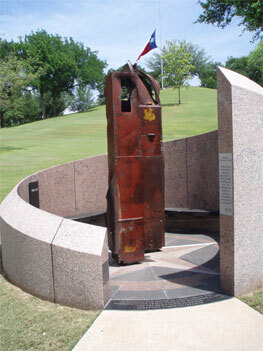 There are handsome monuments to Terry’s Texas Rangers, Hood’s Texas Brigade, and the Alamo outside. We then went to the Bob Bullock Texas State History Museum for a VERY quick visit. From there, it was to my hotel to check in and grab a shower. The place is called The Mansion at Judges Hill, which is a very plush hotel and restaurant in an old house that was used as a drug and alcohol rehab place. It’s one of the nicest hotel rooms I’ve ever seen. Then it was off to Dan’s lovely country club for the meeting. Regular reader Lanny Tanton made a point of introducing himself to me, and we had a nice visit. After a yummy dinner of fajitas, I gave my talk. At the end, Dan presented me with a Florida Gators hat, which I guess is appropriate for someone from Columbus, as a gag gift. My real gift was a certificate signed by the Governor of Texas making me an honorary Texan, which prompted me to say that I guessed I had better stop referring to Texas as “Baja Oklahoma”, which broke up the entire room. 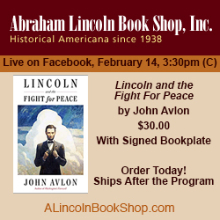 One member of the group brought nine of my books with him for me to sign, and he indicated that he owns about 4,000 Civil War books, of which half are signed by the authors. Dan, another member of the Roundtable, and I had a drink and a nice talk, and then it was off to bed, as I had another very early morning. Dan picked me up at 6:30, and it was off to the airport. I flew from Austin to Atlanta, and then Atlanta to Columbus, arriving here at 1:30 or so. I had to put in a couple of hours at the office to get some stuff out, and that was it for me. Six flights. Three days. Three VERY early mornings. I’m beat. Pictures will follow tomorrow. First, I need some rest…..
As I was looking at my blog earlier today, I realized that the last two posts were the result of random violence leading to multiple gunshot deaths committed by mentally ill individuals. Unfortunately, mental illnesses remain highly stigmatized in this country, and people like the perpetrators of these two crimes did not get the mental health care they obviously needed. It’s clear that something needs to change, and change soon, or else these types of nightmarish scenarioes will continue to play out. While working away at my desk this morning, I learned of the senseless tragedy at Virginia Tech University. Nearly 25 years ago, when I was still an undergrad, I spent a weekend at Virginia Tech that was one of the most fun weekends of my life. Consequently, I’ve always had very fond memories of the place. Today’s news was shocking, to say the very least. That this sort of thing continues to happen is nearly incomprehensible to me. My friend Tom Perry is a Virginia Tech alum, as is fellow blogger and regular reader Ken Noe. I can’t imagine what they must be feeling tonight knowing that something like this happened at their alma mater. Susan and I have an old friend named Melissa Delcour. Some of you may know Melissa. She is a high school teacher in Virginia who has worked as a staff historian at the Fredericksburg/Spotsylvania battlefield park. This evening, we got an e-mail from Melissa indicating that one of her former students, a lovely young woman named Emily, who graduated from high school last spring and was wrapping up her freshman year at Virginia Tech, was one of the casualties today, struck down in the flower of youth. Hearing that–being able to put a human face on this senseless tragedy–makes it all the more real and all the more personal. My heart goes out to Emily, her family, the rest of the victims, their families, and everyone else whose life was touched by today’s events. We can only hope that nothing like this will ever happen again, although I fear it will. One thing that I particularly enjoy is meeting other writers. I especially enjoy meeting other writers from other disciplines, because I learn from comparing their research and writing methodologies with how I do my work. On December 8, 2004, the 24th anniversary of the assassination of John Lennon, a tragedy occurred here in Columbus. A mentally ill gunman rushed the stage at a local venue called the Alrosa Villa, shot and killed a prominent thrash metal guitar player named Darrell Abbott, and was going to go after other members of his band, called Damageplan. One of the band’s roadies, a patron, and a member of the Alrosa security team rushed the gunman and tried to take him down and were all killed for their trouble. A special duty Columbus police officer killed the gunman with a single blast of his shotgun, saving countless lives. It was a terrible tragedy, and put the Alrosa Villa and Columbus on the national radar screen, and definitely NOT in a good way. A fellow from Dayton named Chris Armold spent fourteen months researching and writing a book on this event, titled A Vulgar Display of Power: Courage and Carnage at the Alrosa Villa(the title of the book comes from the title of an album by a metal band called Pantera; Darrell Abbott was one of the founders of Pantera). Chris is a free-lance writer who mainly focuses on heavy metal rock and roll, but this episode obviously intrigued him enough to tackle a major project on it. I saw a piece on the news about the book and decided that I wanted to read it. We stopped by a local Borders yesterday and I was surprised to find that Chris was conducting a booksigning there when we got there. I had looked the book up on Amazon and saw that Chris had been a master sergeant in the Air Force who’s written a couple of books on military history, and we ended up having a rather lengthy and delightful conversation comparing the differences between true crime writing and military history writing, and also about how different it is being able to speak to witnesses and participants instead of having to rely upon 140 year old documents as I so often have to do. He pointed out that while it’s nice to be able to speak to people first-hand, the downside of that is that there are lots of people who will criticize and pick on any tiny little error. Fortunately, I don’t have that to contend with, but everyone is a critic who will criticize almost anything, so I understand that. I really enjoyed talking with Chris, particularly when I learned that he had an ancestor who served in the 45th Pennsylvania Volunteer Infantry of the Ninth Corps who was wounded in action at both Antietam and at tthe Wilderness. 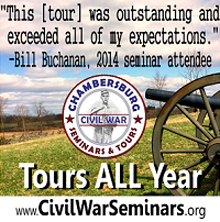 Chris has a real interest in the Civil War, and he is knowledgeable about the Civil War. He even expressed an interest in one of my books, which was very flattering. We left it that we would stay in touch, and I hope that happens. You never know who you’re going to meet at a bookstore…. We Are A Top Blog!